SpaceX's Falcon 9 Rocket successfully touched down on a drone ship after launching today (April 8). In a dramatic feat of engineering prowess, the private spaceflight company SpaceX successfully landed a reusable Falcon 9 rocket booster today — the second such landing for the company, and the first successful touchdown on a ship. This was the fifth attempt in 15 months by SpaceX to land one of its rocket boosters on a drone ship; in each of the previous four tries, the rocket reached the ship successfully, but failed to stick the landing. During today's landing, SpaceX staff members crowded around the company's control room, and let out a roar of applaus when the rocket booster touched down. SpaceX has made one successful landing of a Falcon 9 booster in December 2015 — but that was on a landing pad on solid ground, at Cape Canaveral. SpaceX's CRS-8 cargo mission launched to the International Space Station from Cape Canaveral, Florida, on April 8, 2016. Today's launch kicked off SpaceX's eighth attempted cargo run for NASA, as part of the agency's Commercial Resupply (CRS) program. This is the first time SpaceX has launched a Dragon cargo vehicle for NASA since June 2015, when one of the company's Falcon 9 rockets exploded shortly after liftoff, destroying the cargo capsule in the process. The rocket booster touched down on a robotic drone ship called "Of Course I Still Love You." It is one of two robotic drone ships used by SpaceX for its rocket landing attempts, the second of which is named "Just Read the Instructions." The ship titles honor legendary sci-fi author Iain M. Banks; both are names of sentient, planet-sized Culture starships that first appear in Banks' "The Player of Games," according to Tor.com. "There's minor changes on the nuts-and-bolts level, but that is basically all the changes that we did," Koenigsmann said. The Dragon spacecraft is scheduled to arrive at the space station on Sunday (April 10). Astronauts on board the station are set to grab the spacecraft with the station's robotic arm at about 7 a.m. EDT (1100 GMT). Coverage of the event will begin at 5:30 a.m. EDT (0930 GMT). An Orbital ATK Cygnus spacecraft is already docked to the station, and this will be the first time two American commercial cargo vehicles will be at the station at the same time. SpaceX's CRS-8 cargo mission launched to the International Space Station from Cape Canaveral, Florida, on April 8, 2016. 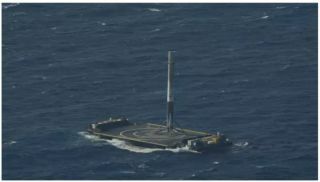 The rocket's first stage successfully landed on a drone ship, marking the company's first successful ship landing. At the news briefing yesterday, Kirk Shireman, the ISS program manager for NASA, mentioned that two features of the Dragon spacecraft are particularly useful to the station: Its ability to return to Earth, and its unpressurized exterior storage compartment (that is, its trunk). Stored in the trunk of the Dragon craft is the Bigelow Expandable Activity Module (BEAM), which is packed up like a parachute but can be made to expand to more than five times its compressed volume. Assuming everything goes to plan, BEAM will be attached to the Tranquility Node of the station, and will become the first expandable habitat occupied by humans in space. Bigelow Aerospace has already tested two other expandable habitats in orbit, without human occupants. The second beneficial feature for NASA is that Dragon can return to Earth without burning up in the atmosphere. This Dragon spacecraft is scheduled to return to Earth on May 11 carrying, among other things, science samples from the One-Year Mission, in which NASA astronaut Scott Kelly and Russian cosmonaut Mikhail Kornienko stayed aboard the station from March 2015 until March of this year. Koenigsmann also confirmed that SpaceX is aiming to increase its total number of yearly launches. "It is true we have to pick up the pace, and we will pick up the pace," he said, adding that the next scheduled launch for the company will come near the end of April, with another set for the beginning of May. "So the time between the missions will get shorter and shorter. It is something we've seen with the 1.1 version, too — when you phase an upgrade in, you need a little bit of time between the launches, and then after a while you pick up the pace," Koenigsmann said. "And we hope we're going to be able to launch basically every other week by the end of the year."